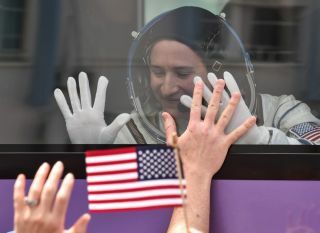 NASA astronaut Serena Aunon-Chancellor gestures from inside a bus before the launch of the Soyuz MS-09 spacecraft at the Russian-leased Baikonur cosmodrome on June 6, 2018. Why? Apparently, they were paying tribute to the first human in space — Yuri Gagarin. The cosmonaut, who launched April 12, 1961, from the same cosmodrome, had to "go" on the way to the rocket … and the rest is history. Various other Gagarin tributes also come into play for launch crews — they also visit Gagarin's grave in the Kremlin Wall Necropolis in Moscow. And after arriving in Baikonur, they plant a tree in the same grove where Gagarin planted his; and they visit his office, which has been preserved since his death in 1968. Gagarin's achievements mark an important milestone in Russian space history. However, today, his story is about much more than the actual biographical facts — it transcends the living person and becomes something more mythological. Why is that? And can we say the same about any famous American astronaut, such as Neil Armstrong — the first person to walk on the moon? "I don't think there is a comparison. Gagarin fulfills the function of national hero and personal example in a way that is not true for American astronauts, at least now," Andrew Jenks, a history professor at California State University, who wrote a 2012 biography on Gagarin called "The Cosmonaut Who Couldn't Stop Smiling" (Northern Illinois University Press), told Live Science. "So, most of my students, at least, know very little about space travelers of any nationality, including Americans," he continued. "Gagarin, on the other hand, is presented as a model to follow and [an] example of national character — optimistic, sober, diligent, loyal and patriotic, a great son, husband and father, etc. Of course, this image clashes in many ways with the real Gagarin, which is one reason that Russians don't like foreigners like me challenging the mythological Gagarin, and also why many prefer the myth to the man." Jenks added, "So, unlike American space heroes, Russian space heroes have acquired a broader sociological and political significance, and for this reason, it is hard to make a comparison." He explained that Gagarin's unique status not only developed because he was the first man in space and someone who personified technological achievement, but also because his modest background and ability to perform on the public stage were perfect for embodying Soviet power — much like the military heroes from World War II. Gagarin also showed the promise of being able to succeed, even after the Soviet Union was devastated by that war, Jenks said. "He was, in short, the son that every mother might want, and in the context of so many sons going off to war and dying, this was very important, indeed." Copying Gagarin's rituals before a Russian launch, he added, helps the crews to make a dangerous mission more routine, at the same time that it honors Gagarin's contribution. The Russians are now talking about moving human missions in the coming decades to an eastern Russian launch pad called Vostochny. Jenks said the rituals will likely change if that move occurs, but Gagarin's stature will not diminish in importance. "I am confident that Gagarin will remain a revered mythological figure, both within and beyond the Russian space program. He was, after all, the first in space and that will never change. In addition, under [Vladimir] Putin in the last five years, there has been a rigorous renovation of space exploration and Gagarin's mythology to counteract the perceived attack on Russian pride and culture in the years following the Soviet collapse," he said. Gagarin, of course, also fulfills an important role in space communities around the world. In this arena, he is not championed so much for his hero status as he is celebrated as a symbol of our human quest to continue exploring the cosmos. A prominent example of this is Yuri's Night, a worldwide celebration that takes place every April 12, when individual communities commemorate Gagarin's achievement. Created in 2001, the celebration attracts thousands of space lovers worldwide. Astronauts even attend some of the parties or mark the occasion while orbiting on the International Space Station. In 2012, American filmmaker Chris Riley created a film called "First Orbit," in which he tried to re-create what Gagarin saw during his orbit of Earth. Riley spoke with the European Space Agency and discovered that the ISS shows a view that is similar to Gagarin's every six weeks, including the same position and the same lighting at the same time of day. Riley eventually got the footage he needed by partnering with European Space Agency astronaut Paolo Nespoli of Italy, who captured footage from the Cupola – a 360-degree ISS window — during his mission between December 2010 and May 2011. Riley also found the audio archive of what Gagarin said while he was in space. "I kind of felt like I got to know [Gagarin] a bit making this film, hearing him talking in my ear," Riley told Space.com in 2012. "I think he would have been thrilled how, half a century on, his story and this extraordinary moment in human history have continued to live on in this new media age."